Looking for reviews? Read customer testimonials here. Abundant Living Neurofeedback and Counseling is Tulsa's leader in providing cutting edge therapy for Mental health and Healing. Anna Raab, MA, BCN, is the most experienced and highly trained Board Certified mental health practitioner in Tulsa, OK, treating depression, anxiety, attention disorder, bipolar and mood disorders, PTSD, traumatic brain injury, and much more. 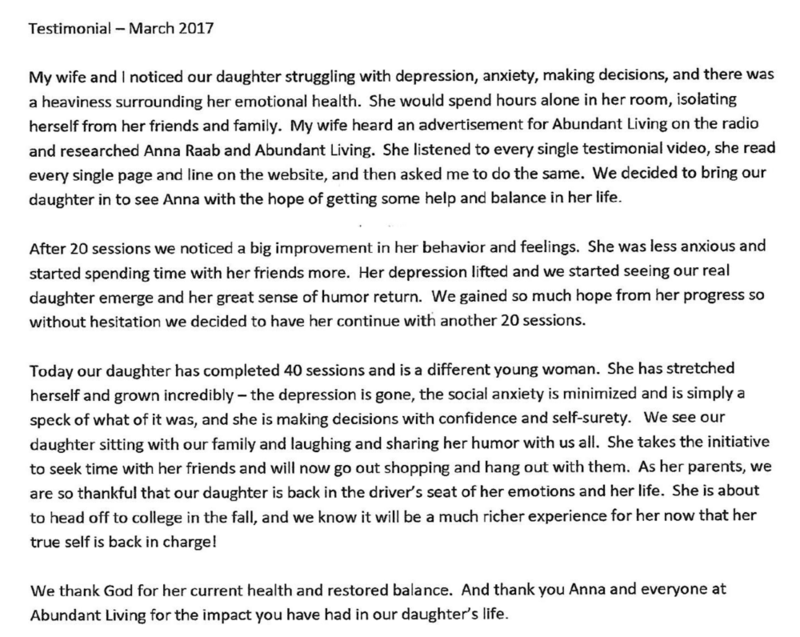 Anna mentors and trains other mental health professionals who are seeking board certification in Neurofeedback and is the only Neurofeedback clinician who is a BCIA approved mentor in Tulsa. I was severely depressed. I had no motivation or energy to do anything. I was tired all the time and did not have much will for anything. I was melancholy, isolated, and lonely. My relationship with my husband was deteriorating and full of tension, hurt, misunderstanding, and no communication. We were on the brink of divorce- It was either this or divorce. Now I’m so much better. I cannot even bring myself into a depressed state- even when I revisit thoughts I used to have. It’s amazing. I no longer feel like something is slowly killing me. I just wanted to be gone. It’s like somebody plugged me back in. I have energy, motivation, and the will to live. My husband says I’m motivated, confident, and assertive. And where communicating wasn’t even possible before, we are now well on our way to working out our issues. I used to be obsessed about certain issues and I would repeat negative thoughts over and over. Now I’m less pessimistic and able to see the good in people and situations. I can now let go of OCD thoughts like whether or not I forgot to turn off the lights. My memory and perceptions were overrun with negativity. Now I see more positively and objectively. I was impulsive, wouldn’t study and couldn’t plan well. Now I can study well and follow through with things that require planning and organization. I used to feel out of body and disconnected- more like I was watching myself, almost like I was in a dreamlike state. Now I feel more present and focused.